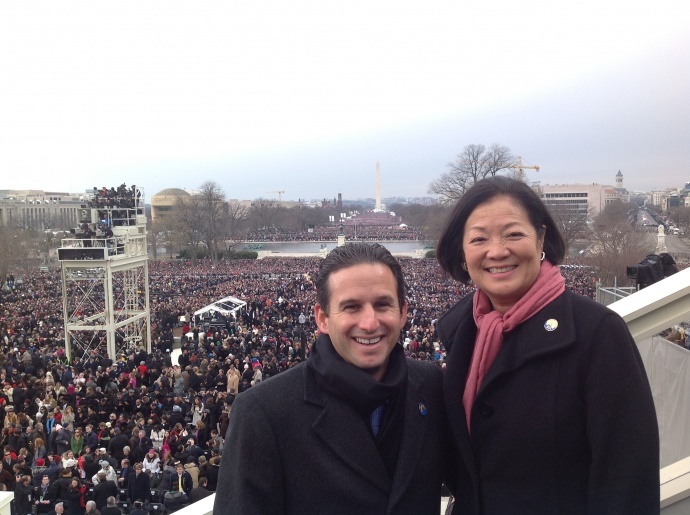 Brian Schatz, Hawaii's Super Senator? The Hawaii politician has a slick PR machine. But can he lead? Civil Beat. A new Nissan Pathfinder, two power saws, tickets to a trendy nightclub and a full sized male mannequin. Those were some of the pricier – or more unusual items – found in the campaign expenditure reports of Hawaii lawmakers. Hawaii Reporter. OSHA turns manufacturing back over to the Hawaii Occupational Safety and Health Division just as Federal funding is again in jeopardy. Hawaii Independent. Cal Kawamoto, who served in the state Senate for a decade and was a tireless advocate for Waipahu, died on Sunday after suffering a heart attack earlier this month. He was 73. Star-Advertiser. An Oahu grand jury returned an indictment Wednesday charging a former teacher's aide at the Hawaii School for the Deaf and the Blind with sexually assaulting a student at the school. Star-Advertiser. Homeless advocates have filed the first legal challenge to the city's sidewalk nuisance law which went into effect in July. Brian Brazier, an attorney for De Occupy Honolulu which has set up camp at Thomas Square, said the confiscation of personal belongings constitutes an unreasonable seizure. Hawaii News Now. It is no surprise that Lex Smith, a well-connected attorney, has been a key player in the contentious efforts to develop the rustic Kahuku Village on the North Shore into a multi-million dollar real estate development. Civil Beat. The new owners of Tesoro Corp.'s Kapolei oil refinery say they are poised to take advantage of a boom in North American crude supplies that could allow the facility to ramp up its production of gasoline, jet fuel and other products. Star-Advertiser. North Shore residents told state transportation officials that barricading the parking lot at Laniakea Beach is not the solution for traffic problems in the area. More than a hundred area residents attended a meeting Wednesday night at Haleiwa Elementary School of the Department of Transportation's Task Force on re-aligning Kamehameha Highway at Laniakea, with about two dozen airing their concerns. Hawaii News Now. Homeless leave Pawaa as city closes down park. Officials say the area needs cleaning for visits by South Korean groups. Star-Advertiser. A Hawaii Kai man is getting ready for a battle with the city in court over a pothole. Donald Fehlmann is suing the city because he says it’s refusing to pay for damage to his car. KHON2. Kaiser High School Principal John Sosa has been placed on paid leave as the Department of Education conducts an investigation. It's unclear what the investigation entails. Star-Advertiser. Funding for the second phase of the Queen Kaahumanu Highway widening project isn’t in any danger of lapsing, at least not on the federal end, officials assured the Kona Community Development Plan Action Committee Wednesday. West Hawaii Today. “Get a grip; we are zero ‘frightened,’” wrote jailed cannabis minister Roger Christie in an email sent to the Tribune-Herald on Wednesday in the wake of news that he and his wife, Share Christie, had accepted a plea deal with prosecutors in their federal marijuana distribution case. Tribune-Herald. A Keaukaha man says he plans to continue to protest Hawaii Electric Light Co. online and on the street after chaining himself to the utility’s Hilo office door earlier this month. Tribune-Herald. A finding of no significant environmental impact has been issued on the proposed consolidated car rental facility for Kahului Airport, and officials hope construction can begin in March. Maui News. Famed rocker Gene Simmons from KISS and his wife Shannon Tweed were in Hawaii in January 2008 to film two episodes of their television reality show, Family Jewels. While they were in town, Simmons was the keynote speaker at the Smart Business Hawaii Annual Business and Investment Conference. Hawaii Reporter. An activities booking business, The Maui Fun Co., has closed, leaving behind possibly more than $100,000 in debts to activity providers, from downhill bike operations to luaus. Maui News. Kauai-based Unlimited Construction Services has been chosen as the design-build contractor for the redevelopment of the iconic Coco Palms Resort on Kauai’s Eastside, the developers said Wednesday. Pacific Business News. The owners of Coco Palms Resort in Wailua announced Wednesday they have sent most of the reconstruction permits to the county and have picked their team to rebuild the hotel. Garden Island. In an effort to take the guesswork out of what container a recyclable should be placed in, the county’s Recycling Office has developed image-based signage with a local flair for the public’s use. Garden Island. The revised master plan for Kokee and Waimea Canyon state parks is back with the Department of Land and Natural Resources. Garden Island.